Lynis is a system security and auditing tool . Lynis is developed by the Michael Boelen . into a log  file  for  debugging  purposes. It scans the system and available software, to detect security issues. It will also scan for general system information, installed packages and configuration mistakes. 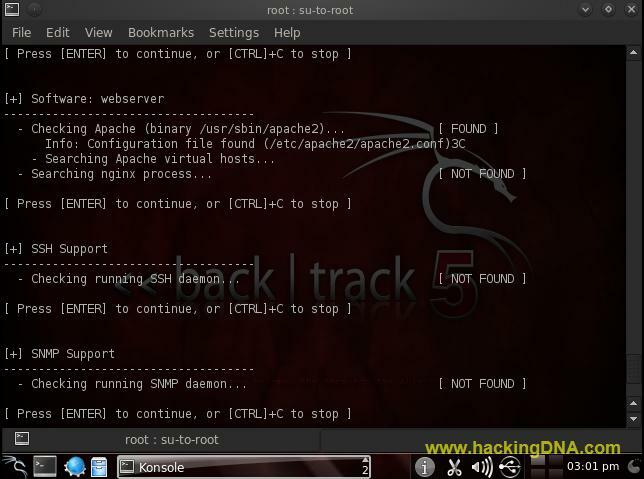 To install Lynis in Backtrack 5 use apt-get install command . It open with a small banner as shown in the below image . It automaticaly start a system auditing . You just need to press the enter Key . To stop the process press [Ctrl]+c . In this below image , it check the boot loaders. In which GRUB2 Boot Loader is present in backtrack. Checks for the kernel . To view lynis.log file , use cat command . This is the best Linux Auditing Program . Lynis gives a depth amount of information and suggestion about your Linux , which help you to improve the security of your Linux . This is best for Penetration Tester, Security Specialist, System Auditors, system or network managers.